With infighting among the Authentics, her mother planning an over-the-top sweet sixteen party, and a romance that should be totally off limits, Daria doesn’t have time for this identity crisis. With everything in her life changing—can she figure out how to stay true to herself? 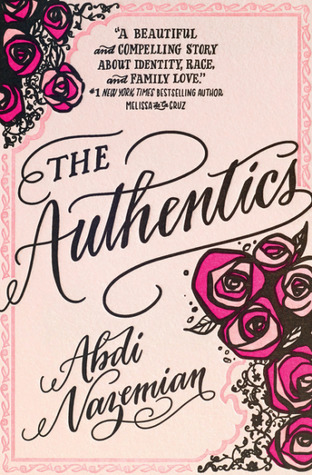 I requested The Authentics from the Indigo newsletter because it sounded extremely diverse– I haven’t read much about the Iranian culture and I am interested in reading about as many different ones as possible. Plus, that cover is gorgeous! I ended up really enjoying this book, as was expected, but I don’t think that it would reign as a favourite of mine. It was very diverse with a good plot, but the main character was a bit dull and I don’t see myself remembering her for too much longer. The Authentics revolves around a teenage girl named Daria. She is of Iranian-American decent, and she is very proud of it. She sees herself and her friend group as very authentic people, and so she has named her posse “The Authentics.” When she is assigned a school project requiring her to research her roots, she finds some shocking information regarding her culture. Will this negatively change her outlook, or will this make her even more authentic than she already is? In spite of the fact that Daria was unmemorable and will cease to remain in my brain after maybe a month or so, I was still fond of her character for sure. She was definitely, well, authentic like this book’s title states, as well as wise, but too many characters of this type simply blend together in my brain. That’s all there is to it. I really loved the premise of this story in Daria finding the truth about her roots and learning to appreciate that, and the plot was full of great events that really kept the story going. I found it so cool to be able to learn about Daria’s family history within the novel and I am glad that this book showcased many different and interesting cultures to explore. There was a small bit of romance between Daria and a guy nicknamed Iglesias, but honestly, it was nothing special. It wasn’t terrible, either- just your average joe romance that appears in a normal contemporary story. Meh. To conclude, I immensely enjoyed The Authentics for its themes on diversity, friendship, pride, appreciation, and even more. To say that I loved the characters would be an overstatement, but the premise is really the focal point of this story. Are you one to devour diverse novels? If so, then you will definitely enjoy this authentically diverse book once it releases on August 8th!